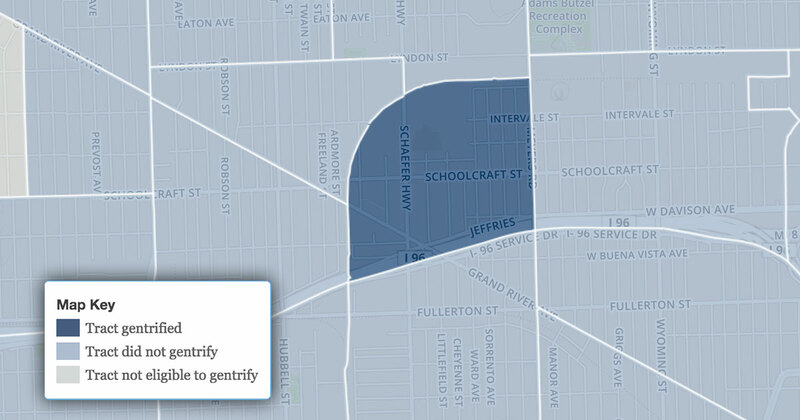 One of the hottest discussion topics around Detroit right now is the one about gentrification. There is no question that the city is changing, but it’s worth taking a look at the numbers to see what’s really going on. These lower-income Census tracts experienced significant growth in both home values and educational attainment. 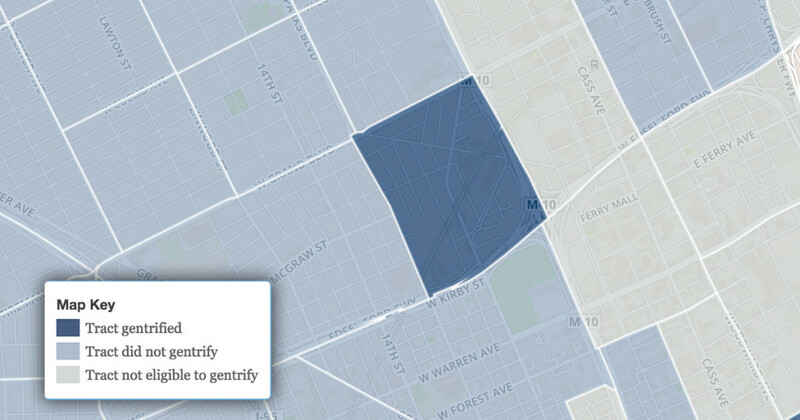 To be eligible to gentrify, a tract’s median household income and median home value needed to fall within the bottom 40th percentile of all tracts within a metro area at the beginning of the decade. 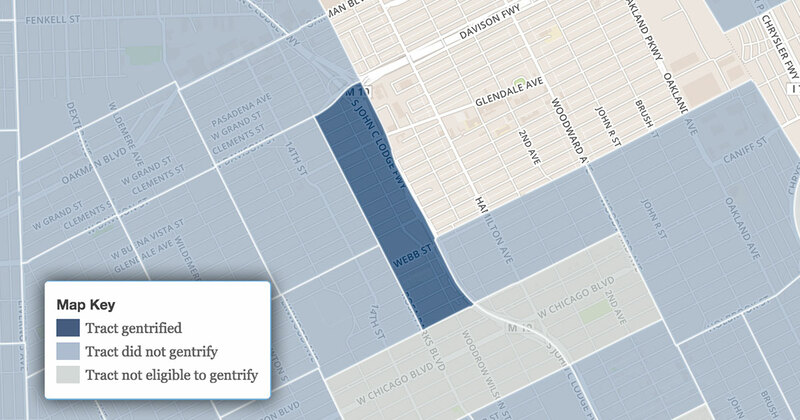 Tracts considered to have gentrified recorded increases in the top third percentile for both inflation-adjusted median home values and percentage of adults with bachelors’ degrees. 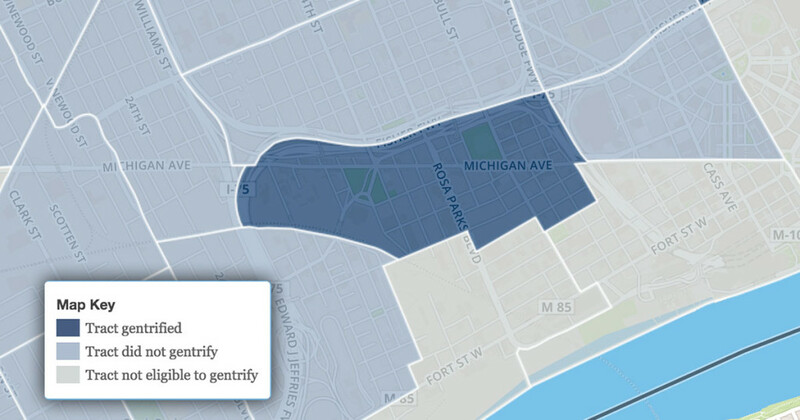 Unlike the conventional dictionary definition of gentrification, which is open to interpretation, this definition positions gentrification within a set of measurable data parameters. For some context, by percentage of census tracts, Detroit has gentrified less since 2000 (2.8%) than when it did from 1990-2000 (3.5%). This is line with the fact that despite the press in some areas, the city as a whole still lost more than 65,000 people since 2010, and almost all of those are African-American. Add to that, in a list of the top 50 metro areas in America that are gentrifying, Detroit is almost at the bottom and ranks 47th. It seems that, at least locally, we’re confusing the pretty new buildings and storefronts for an increase in actual income or wealth among the people. 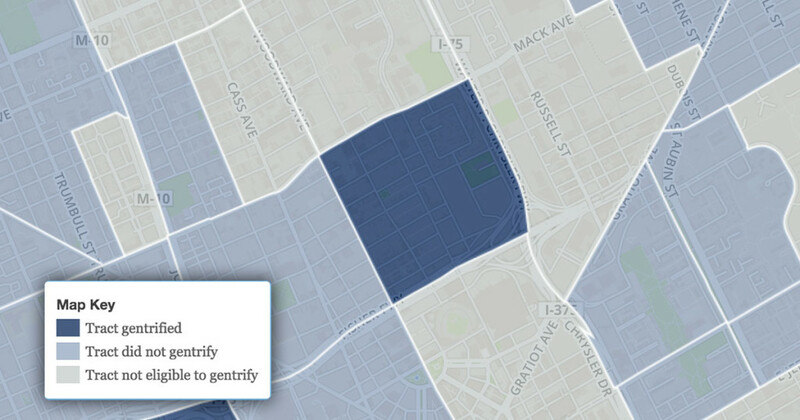 Even oft-held up neighborhoods like Midtown have lost thousands of residents over the last 14 years (Approximately -4,500 taking into account the census tracts in the borders they present). 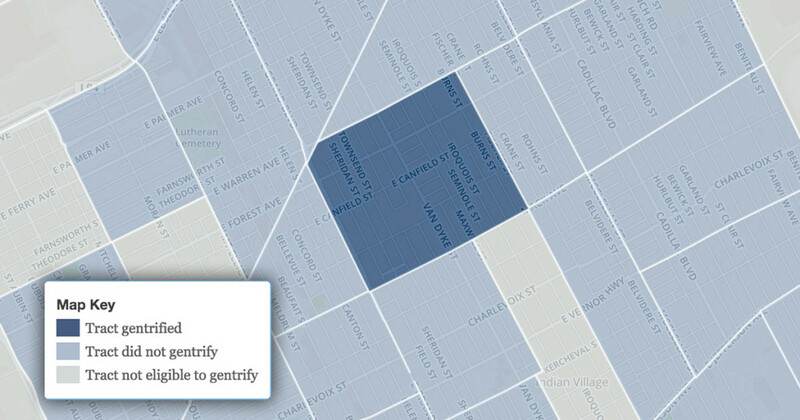 It’s also interesting to look at the maps (we adapted from Governing.com) and see where economic gentrification has actually occurred or started since 2000, versus to where it’s more psychological or visual, or if the neighborhood wasn’t so bad to begin with economically (and therefore ineligible to gentrify under this definition). Looking through this data from 2000 through 2014, most of these places have had some sprouts of activity, as opposed to the full-blown art gallery and pour-over-coffee-palooza that you’d expect in the current discussion of gentrification. 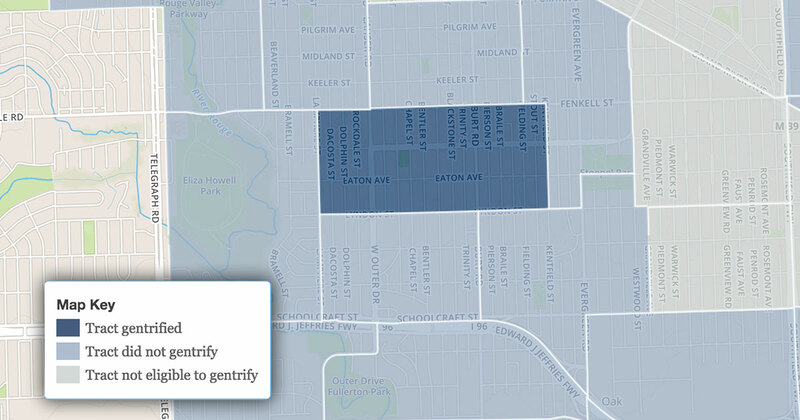 Additionally, gentrification by the numbers is happening in some areas that you wouldn’t expect. This part of the Brightmoor neighborhood saw a major decrease in population along with the rest of the city, (down to 1,443), but a big jump in those with Bachelor’s Degrees (an almost three-fold increase by percentage since 2000). Median home values also rose a stunning 48% here. Part of the Littlefield neighborhood weathered the last few years well as far as the data goes. This area on the west side of the city saw home values rise 12%, and more than a doubling of those with Bachelor’s Degrees. Although this area lost close to 900 people as part of the exodus, the median home value shot up 43% to $58,900 in this tract. It also neighbors Boston-Edison and Arden Park on the south. This entrant in our list is definitely not surprising, and is one of the few neighborhoods to gain population in the city of Detroit (+109). Corktown’s median home value is a quite respectable $126,400 and is up 26% since 2000. For fun, the other big winner in the city? Nearby Woodbridge.  Up 960 people since 2000. You know those oft-shared pictures of a vacant Detroit with an old Victorian home and the Renaissance Center in the background? That’s shot in this neighborhood. A neighborhood that has a whopping eight times the number of people with Bachelor’s Degrees living in it since 2000 (now 33.2%). No wonder developers are currently in a fierce race to make something happen on the available land here. Home value is only up 3% but it’s a (high for the city) $122,100. The potential for upside here is still huge due to its location on M1-Rail and next to the stadia. This neighborhood that’s near New Center and Midtown is getting major investment, most notably from Henry Ford Hospital for an extension of their campus. The well-loved Recycle Here! is also in this neighborhood, bringing lots of artists and residents of all kinds for their programs. The Research Lofts are also here. This tract that is a part of the Kettering neighborhood lost half of its population, but saw the number of people with Bachelor’s Degrees amongst those who stayed and moved in quadruple. It also has one of the higher median household incomes in the city at $32,258. There are stunning divides, even within the city. If you cross Gratiot to the north and household income drops more than half to close to $15,000. It’s proximity to Indian Village and the resurgent West Village is a strong card for this neighborhood to play.